If I had to come up with a Mt. Rushmore of NHL Defenseman, My list would include Bobby Orr (Boston Bruins), Nicklas Lidstrom (Detroit Red Wings), Ray Bourque (Boston and Colorado Avalanche) and Denis Potvin of the New York Islanders. I would welcome any feedback off of this list. All of these players have won multiple James Norris Trophies, and played on Stanley Cup Championship Winning Teams. When the Detroit Red Wings faced the Florida Panthers on March 19, 2015 at the BB&T Center in Sunrise, FL., I had a chance to speak with Potvin before the game. When I told Potvin that he was on My Mt. Rushmore List, he was humbled, his face lit up and his voice perked up as well. While he may have been surprised by this, any person that has followed hockey for decades would see justification in adding him. Indeed, he deserves to be on it. Potvin was the Islanders first overall selection in the 1973 NHL Draft. He played his entire career on Long Island from 1973-1988. He's a four-time Stanley Cup Winner of the early 1980's Islanders' Dynasty. He also won the Norris Trophy three times. In 1991, Potvin reached immortality by being elected to the Hockey Hall of Fame. He was the captain for the Islanders when they won four consecutive championships, in addition to making five straight Stanley Cup Finals Appearances. During his eight years as Islanders Captain, New York never failed to reach to reach the playoffs. When Potvin retired, his career numbers were as follows: 310 goals, 742 assists for 1,052 points in 1,060 games, along with 1,356 penalty minutes. He was the first defenseman to reach 1,000 career points. 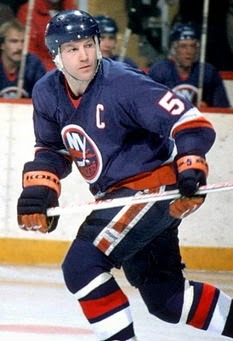 On February 1, 1992, Potvin's No.5 Jersey was retired by the Islanders, the first such honor bestowed by the franchise. After his playing days, Potvin was a color commentator for the Florida Panthers television broadcasts on FS Florida from the team's inception in 1993 to the 2008-09 season. On May 6, 2009, the South Florida Sun-Sentinel reported that the Panthers would not renew his contract in order to save money. He was replaced by former Panthers player Bill Lindsay. In September 2010, Potvin was hired by the Ottawa Senators to be their colour analyst on Rogers Sportsnet. But on August of 2014, he was rehired by the Panthers new owners working with Steve Goldstein on Fox Sports Florida. Before the Red Wings 3-1 loss to the Panthers, I had the Good Fortune of speaking with Potvin in a Q&A Interview. Q: Are you happy to see the New York Islanders (44-26-5) winning again? A: Sure I am. It's been a long, long time. I speak for all of the alumni. We've been waiting for this to happen. It's almost shameful what's happened since over the years where they're not very good, not able to get a lot of support in the county, and now they're finally leaving. It's kind of sad. Q: What are your thoughts about the Islanders move to Brooklyn, NY? It never dawned on me that this would happen although I'm very aware of the issues they've had with the aging and outdated Nassau Veterans Memorial Coliseum. A: The arena in Brooklyn is supposed to be a basketball arena and it doesn't have the attendance the NHL normally requires (15,795). So I think it's a work in progress. I was told by Garth Snow the General Manager that they are signing a long term lease in Brooklyn. But we'll wait and see what happens. They did say to the alumni that they would preserve the jerseys, the Stanley Cups and everything else. So they want to keep the history of the Islanders alive. Q: Do you see some positives coming from this move into The Big Apple? A: On the other hand, I know the New York area very well. You're just a stones throw away from Madison Square Garden, and it could become another intense rivalry like we had. The City of Brooklyn has a lot of people and they can be very intense about their teams. That's the way it's going to go. Q: How impressed are you that the Detroit Red Wings have made the playoffs 23-Consecutive Years? A: Like everybody else, it's unbelievable. I don't know how they do it especially in the Salary Cap Era. But on the other hand, my quick answer is they have a formula that works. Mike Babcock is a terrific coach, but he doesn't see a rookie until he's 23-years old. That's where you get the consistency. They don't bring players up that can make a lot of mistakes. They bring players up that are seasoned and that have had their chance to make their early mistakes at 19 and 20 years old. That's why you can see the consistency. Q: What do you think of Red Wings GM Ken Holland? A: Ken Holland is so well respected. When this 3-3 Overtime comes alive, you'll have a picture of Kenny on the side boards. Whenever a guy of this stature makes a recommendation, people listen to him. This is a game of wins and losses. That's the bottom line. If Ken Holland was in an organization which hadn't made the playoffs in five years, it doesn't quite work. This is all about wins and losses. And Holland has directed that very well for his franchise. Q: What are your thoughts of the Red Wings switch to the Eastern Conference last season? A: I like it. It's fine. I'm very happy for the realignment. It's tough on the Florida Panthers to have to go to Ottawa in the Eastern Conference. I was hoping that there would be realignment that would allow Florida to be in the same area as Raleigh, NC (Carolina Hurricanes), Nashville, TN, Tampa Bay and Washington. For Florida teams, people don't understand the amount of travel involved. Detroit more than anyone is going to benefit because of the amount of travel in the past playing in the Western Conference. They'll see how much easier it is in the Eastern Conference. It was brutal for them for a long time. Q: Former Red Wings player Gerard Gallant seems to have done a nice job as Panthers coach. Is that why they're in playoff contention with a 34-26-14 mark? A: Yes! We all like Gerard Gallant. When the players tell me that they look forward to coming to the rink everyday, you know you've reached them as a coaching staff. Gallant has done a nice job. He has good assistants working with him in John Madden, Mark Morris, and Rob Tallas, who are doing a great job developing the young players. Dale Tallon (Executive VP & GM) has done a good job in bringing in the veterans. Much like the Detroit organization, once the core of young players here settles in, you'll be able to take time and develop your younger players like Detroit does, and NOT have the 18 and 19 come up too early. Q: Denis, I know you had excellent goaltenders in New York speaking of Glenn "Chico" Resch, and Billy Smith. What are your thoughts of Panthers standout net minder Roberto Luongo? A: When Roberto Luongo left here (following the 2005-06 season), I will say he was looking to play in the playoffs. You can't blame the guy. In this day, when free agents are there, you can pretty much determine where you want to go. He went to Vancouver and he got a real taste of not only what it was like to be in the playoffs, but to compete in the Stanley Cup Finals as he did. He was on a team that twice went for the President's Trophy in the NHL (Best Record In The Regular Season). Q: Finally, I'm from an Original Six City Detroit, how much of an appreciation do you have for the charter franchises? A: Are you kidding (smiling), I really do! I've been a big fan all my life. I must say, I grew up a French Canadian so the Montreal Canadiens were probably My favorite team. The Red Wings in my time were not a very solid organization so it's commendable to see what Mr. Mike Illitch and the ownership has done. This is about to happen here with new ownership. they're really committed and if we can get close to making the playoffs, and to mirror what the Red Wings have done, South Florida is going to make a big name of themselves in the NHL.